Fixed annuities are insurance products that are guaranteed to return both the principal you invest plus a fixed rate of interest. They are very similar in concept to Certificates of Deposit (CDs), except a fixed annuity grows tax-deferred. There are essentially two types of fixed annuities: traditional fixed and indexed annuities. 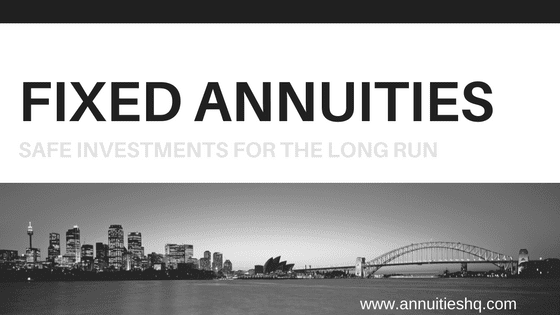 In fact up until 1952 the only type of annuity available was the traditional fixed annuity. The other major type of annuities are variable annuities. One of the most frequently asked questions from investors is “are annuities safe?” When considering fixed annuities, the answer is yes. Fixed annuities are one of the safest investment vehicles available. Although they are not backed by the Federal Deposit Insurance Corporation (FDIC), fixed annuity providers are required by state law to protect their outstanding annuity contracts with cash reserves on a dollar for dollar basis. Fixed rate annuities are insured by licensed and regulated companies in much the same way as your home or auto insurance, so if you’re asking “how safe are annuities?”, fixed annuities are very safe! Under state insurance law, a fixed annuity must provide you with a minimum rate of interest, which will be set out in the contract. One of the major benefits of fixed annuities is the rate of interest they pay. Fixed annuity rates tend to be a little higher than those of CDs or saving bonds. This is because the insurers invest the annuity assets into a portfolio of US treasuries or other long term bonds while assuming all the risk. In this way the insurers are able to pass the majority of the earnings onto their contract holders. Traditional fixed annuities generate interest on the premium contributed by you at a rate that is declared in advance by the insurer. Some fixed annuities will offer the same rate of interest over multiple years while others will stipulate a variable rate of interest over the term of the annuity. For example, in the first year of a three-year fixed annuity, you might be offered a rate of 6%, but for the remaining two years the contract might only pay you 3%. Whatever the rate agreed upon, it can never be less than the minimum guaranteed rate stated in the contract. Fixed annuities are very conservative but safe investments for retirement funds. Still on the fence? We broke down the pros and cons of annuities as part of our guide to annuitiesto help you decide if they are best for you.